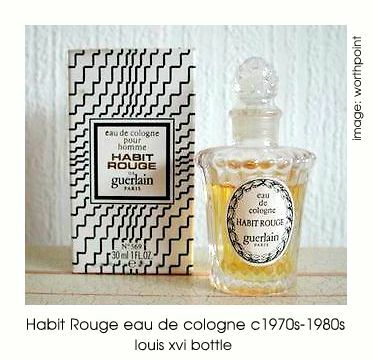 Habit Rouge: launched in 1965, created by Jean Paul Guerlain. Habit Rouge means 'red jacket' or 'hunting coat' and refers to professional equestrians' dark red jacket. The bottle was designed by Robert Granai. So what does it smell like? It is classified as a fresh spicy fragrance for men. It starts off with a fresh spicy top of bergamot and lemon, followed by a spicy woody heart of carnation and patchouli, resting on a sweet, powdery base of vanilla and amber. "And that was Guerlain's thinking when they brought out Habit Rouge, a complete collection of grooming goodies for men. 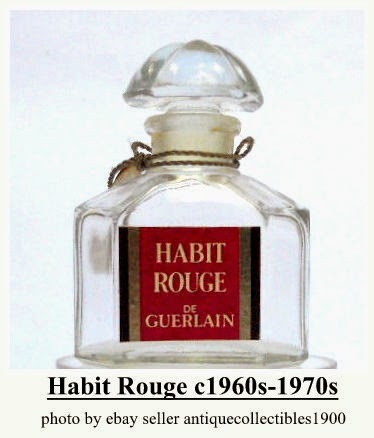 Habit Rouge was named for the fox hunter's scarlet coat and the scent's spiked with spice and subtly different." "Habit Rouge means 'hunting coat': think about that for a moment. Habit Rouge for men by Guerlain. Available in cologne, after shave, Capillaque for the hair, shaving cream, and soap." "The New Yorker magazine, for instance, ran the first of a series of insertions for Guerlain's Habit Rouge hair spray, then suddenly up and canceled the rest. "They thought it was too much," exclaims a Guerlain spokesman. "Too effeminate or something." "Get a whole skulk of foxes worked up with the excitement of the chase. Guerlain's Habit Rouge is a scent as crisp and bright as the hunters' pink coats from which it takes its name." Reformulated and relaunched in 2003. It is classified as an oriental woody fragrance for men. Habit Rouge Armoiries: was introduced in 2006, as a limited edition flacon, with a review of the 18th ct. and tradition of the house. The flacon features an engraving on glass with the old logo of Guerlain. It was created in limited number of only 454 pieces, in amount of 240 ml. Each flacon is individually numbered. The fragrance of Habit Rouge is not changed. Habit Rouge Beau Cavalier: is a limited edition flacon by Guerlain introduced in 2009. The bottle was created for its fans as a true trophy designed of metal and packed in fiery red outer carton. The metal flacon is decorated with transparent monograms. This limited edition for men is available as 100 ml EDP. Habit Rouge Habit de Cuir: is a limited edition flacon for 2011, made in honor of the legendary perfume. The fragrance comes in a bottle covered in red leather as 100 ml EDT. Habit Rouge de Metal: for 2008, a new limited edition bottle was created for Habit Rouge. The new edition is coming in a metallic red bottle with metallic colored top, encased in a silver outer box. Habit de Metal is a limited edition flacon and was available as 100 ml (3.4 oz.fl.) EDT.